Unless I use the excuse that it was meant to be a long term evaluation of course! Short and sweet: the Micatech Pack Rack, when used alone or with the medium Top Case installed, is a near-unbeatable combination for adventure touring activities — up hill, down dell and over terrain that rattles the teeth. With two original issues addressed in short order by Micatech, the Pack Rack is performing Herculean duty without a complaint. And with the Micatech Top Case installed, a bit more civility and capacity is introduced without any diminishment in functionality and performance over the rough stuff. The powder-coated exteriors shrug off the daily bumps and bangs and engagements with tree branches. Most rub marks and scars are usually cleaned up with some hard scrubbing so the components keep their sheen and look. I haven’t found anything that cannot be strapped to the Pack Rack — at least safely — and the Top Case holds a lot of stuff, keeping the valuables locked up, out of sight and totally sealed from the elements. Repeating a phrase used in my Roof Rack review, “Micatech is renowned for their unique and totally functional luggage components: quality is second to none.” And regarding these two products all I can say is “ditto”. 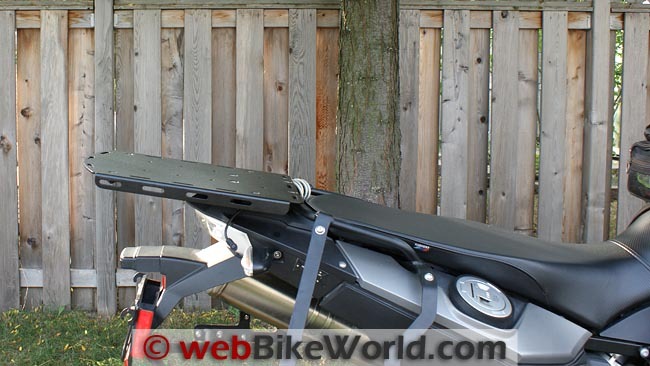 Micatech Pack Rack mounted on the BMW F 800 GS. And like before, it has all been time well spent. After using the Micatech Pack Rack for more than two years, mounted on the 2009 BMW F 800 GS test mule (a tried, true, trusted and treasured part of the family fleet), and one of those years with the Top Case, the combination, used individually or together, has been worth every penny and far more. The Pack Rack is an uncomplicated and purely functional accessory that carries virtually anything that can be strapped to it or across it safely and in spending a few seconds to mount the Top Case, the whole package is just that — an accessory rack that works. Lightweight, strong and somewhat cavernous, the 53 litre Micatech Top Case (the medium size) also reflects the Micatech philosophy: simple, strong, functional and stylish. Some will perhaps argue that the rack and Top Case components don’t offer much in the way of style, but in my mind the pieces are just right for their intended function and fitment. Whereas the Micatech Roof Racks are small but mighty functional, the Micatech Pack Rack and Top Case products are much larger and mighty functional as well. If their current condition is any indication they should be doing their jobs for a long time. Bottom view of the Micatech Pack Rack. Like most Micatech products, these two components are best described as “simple”. That word can conjure up both positive and negative thoughts to some, but for me it is all positive. 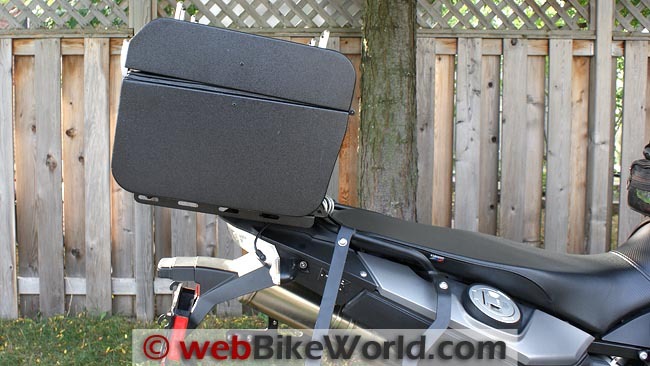 There are lots (and lots) of rear rack products for the popular BMW F 800 GS and F 650 GS motorcycles, but outside of perhaps two others I can think of, none offer the size and thus the deck space of the Micatech Pack Rack. At a whopping 43.2 cm x 33cm x 0.3 cm (17 x 13 x 0.125 in. ), the Pack Rack isn’t small compared to most, but it sure is functional — looking at the rack from the rear gives one the impression of viewing the approach deck of an aircraft carrier. Given the shape of the F-series machines and the design of the Pack Rack, it does seem to hang off the back end of the motorcycle…but that isn’t a bad thing in reality and it also provides a great mounting point for accessory lighting, like a Back-Off or Admore LED multi-function light bar or something similar. Available for the BMW R1100/1150/1200 GS and GS Adventures motorcycles in Large and Medium and the BMW F800/650GS models, Pack Racks are also available for the venerable Kawasaki KLR650A (original large tank model) and the newer KLR650E, the Suzuki DL650/1000 V-Strom and Triumph Tiger 800 and 800XC motorcycles. The typical Pack Rack Kit contains the Pack Rack (per fitment guide), with hardware provided as needed for the specific installation. The kit I got had four M8 x 55 mm flat head SS socket cap screws, two long aluminum spacers, two short aluminum spacers and a single instruction sheet (also available from the website). Consisting of two separately cut pieces — the flat plate deck and the support section — the whole assembly is strong, which it needs to be given its elongated form and forward mounting points. The two sections are anchored and welded together forming a single component. Four quarter-fastener inserts for mounting a Top Case are anchored into the deck. The 90-degree left and right edges provide further strength to the deck plate and themselves are drilled with slotted cutouts which in addition to those provided on the top front, back and sides provide numerous points to secure a load, no matter its shape. 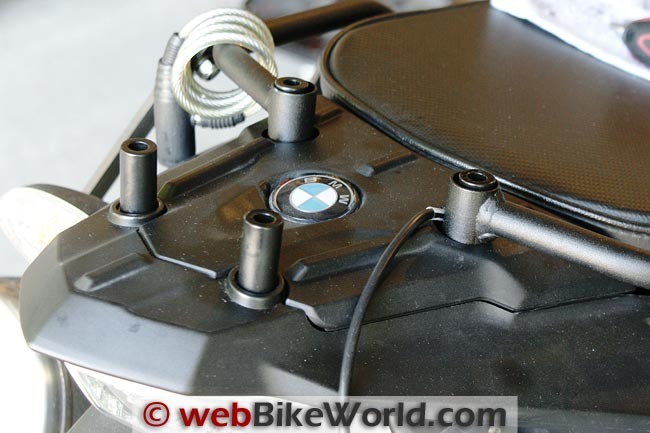 Mounting points on the BMW F 800 GS. Made of the same 2 mm thick 5052 aluminum used for the Micatech side-cases with aluminum and stainless steel hardware for fittings and mounting the Micatech Top Cases are darn light for their respective sizes. At just a few grams over 5 kg (11 lbs. ), the slightly over-square size medium Top Case measures 43.2 cm x 40.6 cm x 30.5 cm (17 x 16 x 12 in.) and has a calculated capacity of 53 litres. Overall quality and strength is outstanding; the powder-coating finish one of the most durable I have seen or used; minor scratches and rub marks can be washed and scrubbed out with some effort, keeping the rich looking pebble finish in fine form. Four tie-down U-brackets, one in each corner of the lid (mounted to the inside with double screws), facilitate carrying of light soft items on top of the lid when needed — I keep a pair of the small pack adjustable ROKstraps in the Top Case for this express purpose. The Top Case mounts to the Pack Rack with four quarter-turn (Dzus-type) fasteners that lock into the four receptacles set into the surface of the rack. Mounting and dismounting the Top Case takes seconds, without tools typically. Fitment options with the proper optional mounting kit provide for either forward or rearward positioning on BMW R1100/1150/1200GS and GS Adventure models to accommodate solo or rider with passenger configurations. All other fitment options utilize the rear position placement. The Micatech Pack Rack on the BMW F 800 GS. The Micatech Top Case (medium size) mounted on the Pack Rack. Installation of the components is straight forward and of course the Pack Rack can be used without the Top Case depending on requirements. 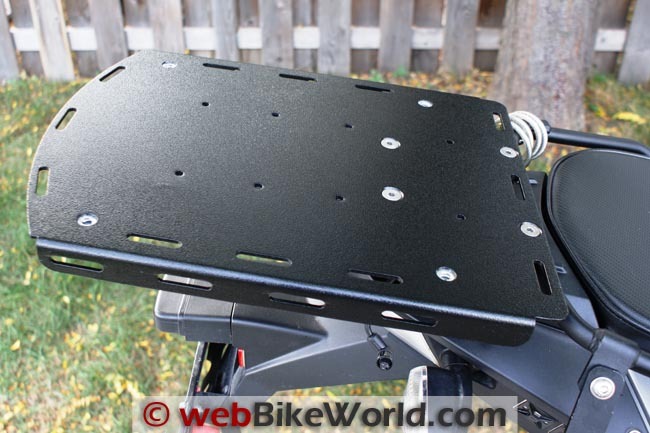 Mounting this component is as simple as the rack itself and even if any pannier or saddlebag bracket is already mounted, most manufacturers use the four OE rear deck mounting points for their brackets including associated top racks, so access to these mounting points shouldn’t be an issue. 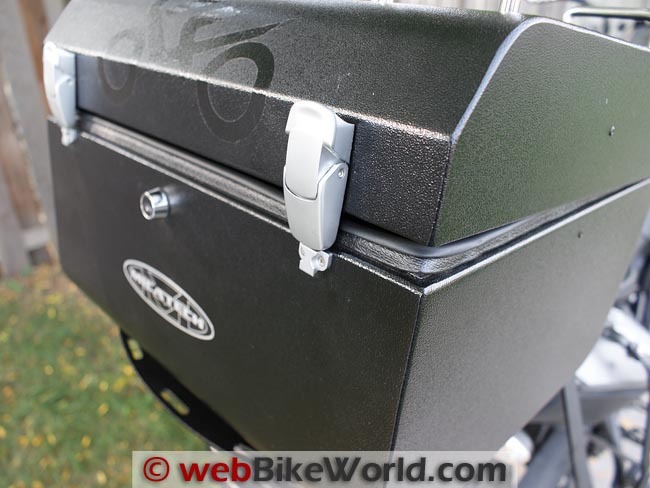 If the host motorcycle is in original form, simply remove the four screws from the rear deck, or from any other rack that may be mounted, providing the real estate needed to mount the Pack Rack. Two short spacers go into the front holes or front insert points on any accessory bracket and the two long spacers are used for the rear. As the Micatech hardware is designed for use with the basic OE configuration the spacers provided are optimized for this layout. 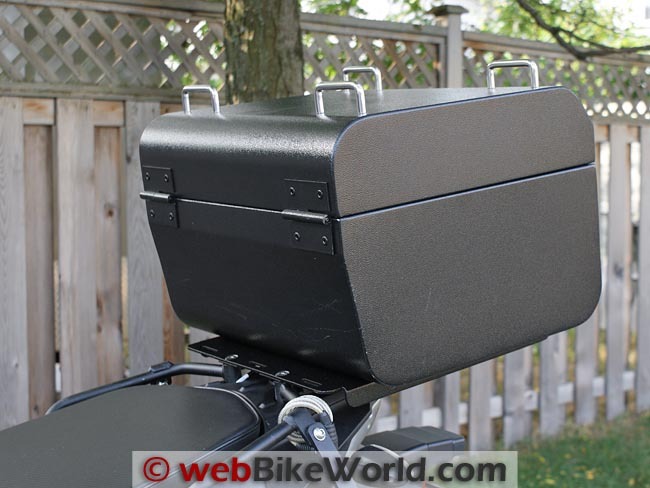 If other spacers have been provided with the pannier (like the BMW Adventure luggage kit) or other saddlebag bracket kits, a bit of time in determining which set or combination provides the optimum angle is good. Matching the elevation angle of the tailpiece is a good guide for function and looks. 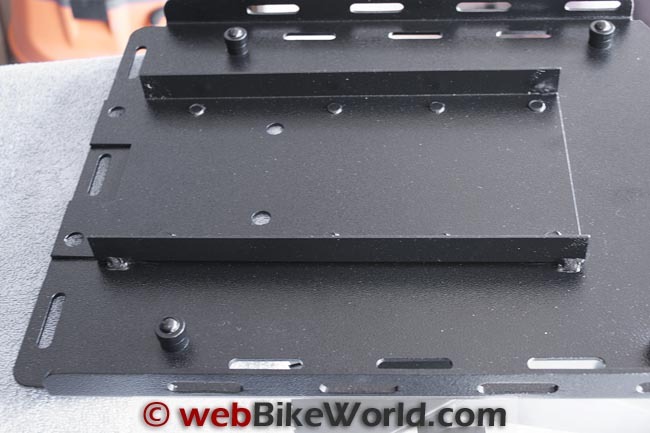 With the desired spacers situated and any brackets loosened off as needed to facilitate installation of the Pack Rack, lay it in place and after treating each of the screws with medium thread-locker compound, mount the rack. Don’t forget to tighten any other hardware as applicable. Details of the Micatech Top Case. Mounting the Top Case is tool-less; align the four holes on the bottom of the case with the four recess holes on the Pack Rack, insert a quarter-turn fastener in each hole and with some pressure on the Top Case, press down firmly on the fastener then turn and lock it — done. As noted in the instructions, when new the fasteners may be hard to engage and if very resistant to use the thin rubber sealing washers can be removed to provide more clearance. Additionally, with or without the washers, a large blade flathead screwdriver can be used to (carefully) provide direct pressure. I didn’t want to take the thin but effective washers out and after using the top-case three or four times some bedding in was evident and since then firm pressure with a hand inside the case and like pressure on the fasteners does the job. And speaking of the hands-on approach, to keep the mounting experience a positive one, you will want to keep a firm grasp of or pressure on the Top Case. The tough and durable powder coated exterior surfaces of the two components make for a slippery matchup between the two, at least until the case is secured in place. 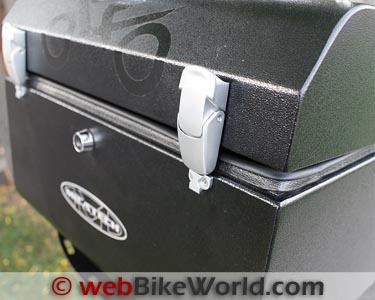 When needed, the lid can be quickly removed by lifting the lid up and sliding if off the open pin latches, and undoing the snap fastener for flat strap that angles and hold the lid open. Wash basin anyone? The Micatech Top Case latches and the waterproof lid gasket. My original version Pack Rack held up well for the first year, getting extensive on and off road use in carrying a lot of different soft-sided weatherproof bags and related kit for travel over a wide variety of terrain. Its long flat surface with 90-degree edges (strength) and cut-outs on the top and edge surfaces make securing loads easy and safe. After taking the rack off, it became evident that the bottom support plate was separating from the main deck plate, probably due to flexing taking place over the length of the rack vis-à-vis the forward mounting points — something that had been noted (then tucked away) at time of purchase. After sending an email and some photos of it all to Sue at Micatech, a quick response acknowledged the situation and asked me to return the rack, which I did. Two weeks later, while in Virginia, a new rack was received, with the enhancements immediately noticeable. The bottom support section was stronger and an additional weld tab had been placed on each corner and, the powder-coating was thicker and smoother than on the original. Result: the whole rack is stronger, with virtually no flexing even when loaded up front to back. Between this and the rock solid powder coating, the rack is performing, and looking exactly as expected. The decision to add a Top Case was made early last year, at which time I debated over whether to go for the Small (40 litre) or Medium (53 litre) capacity unit — for versatility and use at some point in time on larger machines, the medium won out. I subsequently ordered the case directly from Micatech but didn’t manage to get it picked up until the BMW MOA Rally in Bloomsburg Pennsylvania, after having the Micatech crew haul it to and from the earlier BMW RA rally that I missed. Needless to say, my thanks were profuse and five minutes after unpacking the case, it was mounted… As expected the two components look, fit and function as if designed to do so! After over two years’ of use, wear and tear with the Pack Rack and one year with the Top Case both products remain undamaged, relatively unmarked (thanks to the durable exterior coating) and gainfully utilized. With 53 litres of useable space, thanks to a combination of its simple shape and unobtrusive latches and fasteners (which can take up a lot of valuable space on other Top Cases) a lot of stuff can be carefully stored, or crammed into the Top Case with the updated Pack Rack handling that load (and more) in stride. An over-sized square of Oxford Blanket, a non-skid material that I use a lot of, covers the inside floor and sidewalls up about three inches to protect contents from the smooth but hard walls. A similar piece cut for the inner lid is carried and brought into use as needed. The medium Top Case will easily carry any helmet, no matter the shell size, with or without a communications system mounted or even a low profile camera mount, with room to spare for lightweight garments and other sundry items needed. The two strong latches are best operated together to open and lift the lid; when latched and the centrally mounted key lock engaged (which can be keyed to match other Micatech products), the Top Case is secure. And dry – between the pressure fit of the precisely fitted lid on the large weatherproof gasket that runs around the entire upper lip of the Top Case nothing is going to get in, or out. The Micatech Top Case, side view with lid open. The Micatech Top Case with standard cargo mounts on top. Close-up of the gasket and latch of the Micatech Top Case. Note Dzus fastener on bottom (R). Less the issues with the original model, nothing else has failed in any way shape or form. My single nit-pick point regards the flat strap used to angle and hold the lid up; it is wearing a bit thin where the snap fasteners are punched through. Some minor reinforcement around the snaps is probably warranted, but for the size and weight of the lid a latch or hydraulic style lift arm would be a great solution, even if dictating a slight cost increase. My bottom line: no matter what motorcycle the Micatech Pack Rack and Top Case products are installed on they are sure to be aesthetically pleasing, extremely functional and ultra-reliable for a long (long) time. 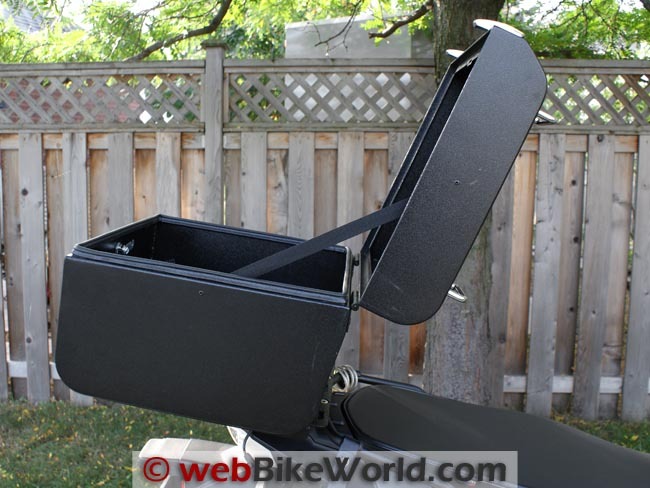 Manufacturer: Micatech List Price: Pack Rack for BMW F800/650GS is $95.00 USD; Medium Top Case in Black is $395.00 USD. Colours: Black, Silver or Vein. Two-colour lid/case combinations are available for an additional $25.00 USD charge. Made In: U.S.A.
Editor’s Reply: Actually, $395.00 for the case and $95.00 for the rack.